For the first time, I understand why the assembly line was invented, and why it was so successful. I have been working on all the bits and pieces that make up the interior of Cabin Boy: breast hook, quarter knees, frames, seat risers and seats. Each one of these pieces is a miniature sculpture in oak, with all the curves, angles, and bevels you could ask for... and a bit more! I started with the port side quarter knee, mainly because it looked relatively simple on the plan. 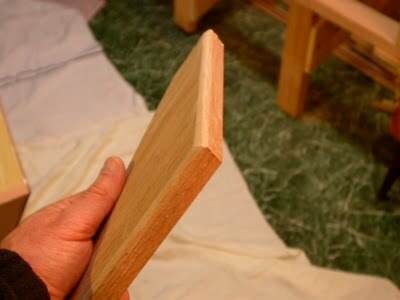 A quarter knee is a curvy, L-shaped piece of wood that reinforces the side-to-transom joint. 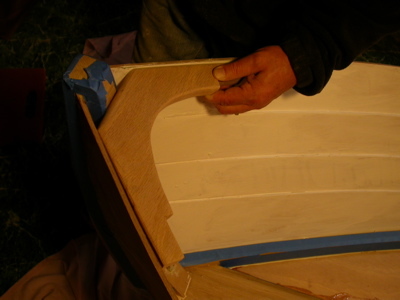 Unfortunately, Cabin Boy's transom doesn't meet the side at a right angle. More like 110 degrees or so. 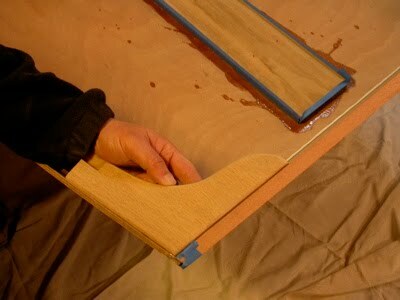 And neither the transom nor the side is vertical, so the two sides of the quarter knee need to be beveled. So not a trivial piece of work. However, confident in my new-found scribing skills, I set to work. 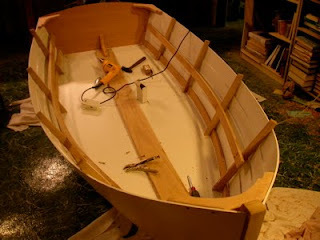 I started by measuring the angle between the top plank on the side (the shear strake) and the transom, and cutting out a rough blank. I made mine out of a single piece of oak. This is not the strongest method... it is too easy to split the part of the knee where the grain is vertical, but the right way involves finding a natural crook, or laminating or gluing up a blank, none of which I have time for, unfortunately. Will blog about how this holds up over time. You have been warned! 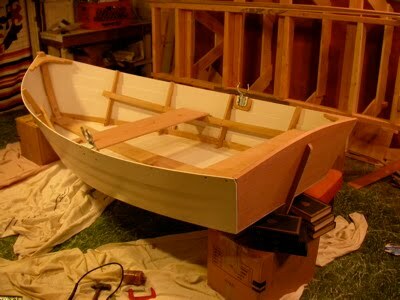 Then I beveled the two sides to fit the boat. I started off being all scientific, with a bevel guage, etc. 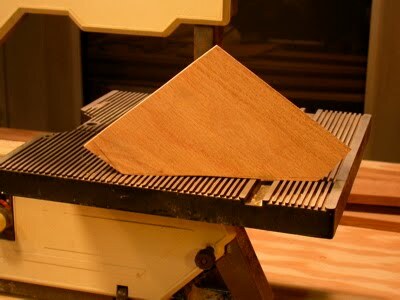 But once it was close, I had to finish the bevels by eye, just sitting next to the boat with a small plane, shaving a bit, trying it on for size, and shaving a bit more. See my 'Make Mistakes Slowly' post for a refresher course on patience! To cut the curves, I went down to my local office supply store and bought a cheap, plastic set of French Curves. I'd never used them before, but found it relatively easy to draw a curve that looked 'good enough'. Good enough for me, anyway. I also cut a square notch for the inwale, which is a strip of oak that curves along the top of the boat, on the inside of the planking. It fits into notches in the breast hook and quarter knee, and is fastened to the ribs. Inwales are optional on Cabin Boy, but help stiffen the boat for sailing. I won't be sailing Cabin Boy for a while, so am not going to install the inwales, but I figured I'd cut the notches while I it was easy to do so. Not sure if this was a good idea, or not, but time will tell. The breast hook reinforces the bow. It's a lot like a quarter knee, only twice as complicated. But after doing both quarter knees, it was not that difficult, and it actually came out better than either quarter knee. Practice pays off. Then it was time to install the ribs I'd cut and carefully labeled the day before. Note that each rib is a different shape, but they all look similar, so it's really, really helpful to label them so they don't get mixed up. I some how managed to avoid this mistake, and I'm happy that I did! The most physically challenging part of the whole build was installing the seat risers. You can see them screwed into the ribs on both sides, in the picture above. I had to elist two helpers to install these. The White Oak needs to be bent into the curve, and then you need to mark off where the 8 screws (each side) will go. Very hard to do single handed. This was such a circus, that I forgot to take any pictures. Suffice to say my biceps are still sore! After all those bevels, angles, curves, and brute force, fitting the seats and oar locks was a snap. Which is a good thing, because I need to leave for FL tomorrow! Whew... so that's what you can do in one, very long day, if you really need to. That my man is a beautiful work of craft. Thanks, guys! You should see how nicely Cabin Boy tows behind a sailboat. I was too busy to take pictures on our first, short sail out into the Gulf of Mexico today, but I kept casting glances back at Cabin Boy to see how he was doing. In a word, great! That big skeg keeps him pointed beautifully behind his big brother. And he's skims so lightly on the end of the tow rope that the drag is negligible.